I tested it with oil at 120 ° C, but it was about 30 minutes but no deformation was seen. This review is about item#32587012. It does not fit to the cable holder on hand (too thin) Can not fix, so re-purchase another new cable. However, I think this cable is flexible and easy to use. There was no problem if raising it one size. It was a select mistake. This review is about item#32587046. This review is about item#32587055. Because it is not necessary in 100 M units, 10 m, 20 m units are saved. This review is about item#32587204. 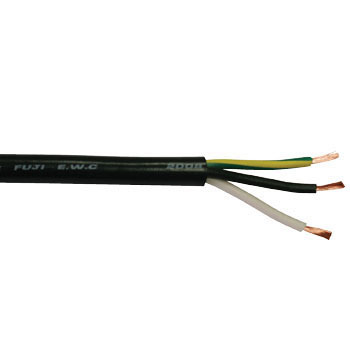 Because the electric wire of the power tool is hard, it is used for renewal, it is soft and I like it very much. If you need it in future we will check the lineweight weight and buy it. This review is about item#32586976. It is satisfactory product. It is used in cold climate but it is soft and easy to handle even minus 5 degrees. I also want something a little longer than my cut-out length. This review is about item#32587003. Very soft and easy to use, even when passing through a narrow place is slippery. This review is about item#32587037. It was not the cap tire cable (S - VCT) but the cap tire cord (P - VCTF). Product name and symbol are incorrect. Please be aware that core specifications and allowable current are different. It was flexible and very good with the use outside the vehicle wiring. It is soft and easy to handle. It would be nice to have cheaper products of larger size.